Audi is driving forward progress in its gasoline engines. The term Rightsizing incorporates a host of innovative technologies. The key is to design engines with the optimum combination of displacement, power and torque delivery, fuel consumption and operating characteristics. Cylinder deactivation in the 4.0 TFSI is one example. Audi is working on new, intelligent technologies to reduce fuel consumption even further. The predictive efficiency assistant uses data from the navigation system to enable the car to slow down in an anticipatory manner. 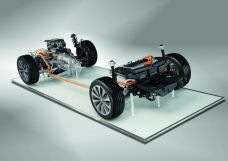 Audi offers full hybrids with lithium-ion batteries in three vehicle classes. The A6 hybrid (Combined fuel consumption in l/100 km: 6.2; Combined CO₂-emissions in g/km: 145)**, the A8 hybrid and the Q5 hybrid quattro (Combined fuel consumption in l/100 km: 6.9; Combined CO₂-emissions in g/km: 159)** use a parallel driveline – a highly efficient concept. Audi is systematically working out all aspects of electric mobility from the ground up. 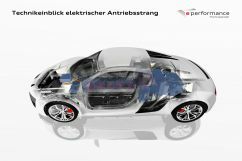 The e performance research project – a think tank within the company – has developed a modular component system for electrically powered vehicles. This has resulted in a sporty research vehicle, the F12, in the framework of a research project sponsored by the German Federal Ministry of Education and Research (BMBF). The term e-tron covers all Audi cars that can drive for longer distances on electricity alone. The brand is working on all aspects of the issue and with different approaches – from pure electric drive through plug-in hybrids to the electric quattro driveline. The Audi R8 e-tron, the first low-volume electric vehicle to be produced by Audi, is an uncompromising, high-performance sports car. Its two electric motors deliver an output of 280 kW (381 hp) and 820 Nm of torque. All of the energy comes from the large lithium-ion battery that stores 48.6 kWh. The Audi R8 e-tron completes the sprint from zero to 100 km/h in 4.6 seconds, achieves an electronically limited top speed of 200 km/h and covers a range of around 215 km. 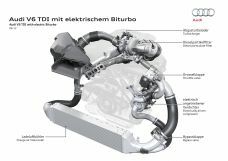 With the electric biturbo, Audi is taking another major step forward in its TDI engines. In this forward-looking technology an additional compressor assists the turbocharger in the lower rev range. Almost a quarter of a century ago, Audi delivered a major boost to diesel engine development worldwide. 1989 saw the debut in the Audi 100 of the first direct injection compression ignition engine with turbocharging and electronic control, since when the TDI has enjoyed an impressive and ongoing success story. The Audi A3 Sportback g-tron, the brand’s first natural gas car to go into production, reveals the sheer depth of the technological expertise of Audi – from ultra lightweight technology through the highly advanced infotainment to the driver assistance systems. It showcases state-of-the-art CNG technology (CNG = compressed natural gas), complete with the fuel storage technology. Its two pressurized tanks beneath the trunk floor each hold around seven kilograms (15.43 lb) of gas; they essentially use the recess for the spare wheel, thus impinging only minimally on the load capacity. Audi is promoting the development of new CO₂-neutral fuels. ** The underlying technology is completely new: Microorganisms utilize solar energy to produce synthetic ethanol and synthetic diesel from carbon dioxide and water. The problem has been familiar for a long time, but it has yet to be solved: The combustion of conventional petroleum fuels pollutes the atmosphere by releasing carbon dioxide into it. Ethanol and diesel made from renewable raw materials such as maize and rapeseed generally achieve a better environmental balance, because the plants have already previously absorbed the CO₂ that is released when they are combusted. ** But such fuels are costly and compete with food agriculture – so they do not represent a long-term solution in a world whose population continues to grow increasingly rapidly. By 2013, the Audi a-gas project will make the brand with the four rings the first automaker worldwide to have built a whole chain of sustainable energy sources. Audi creates an ecobalance for each new model that evaluates all phases of its lifecycle. The brand’s lightweight and efficient models are particularly effective during the operating phase – thanks to know-how in ultra-lightweight design and drive technology. Ecobalance, also known as life cycle analysis or life cycle assessment (LCA), analyzes the environmental impact of a product throughout its entire lifecycle. It serves as a quantitative evaluation of ecological aspects such as the emission of greenhouse gases (including CO₂)**, energy consumption, acidification or summer smog. In compiling ecobalances, Audi uses a standardized procedure in accordance with ISO 14040. 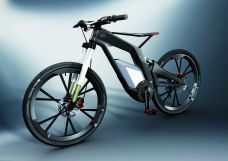 The Audi e-bike Wörthersee is a high-performance sports machine for sporty people. Its design reflects the concentrated dynamism of the brand, with CFRP playing a major role in its ultra-lightweight design principle. The changed role that the car will adopt in the mobility of tomorrow is creating space in the world’s major cities for new means of transport – for lean, lightweight and efficient vehicles with two, three or four wheels, for e-pedelecs, e-skateboards, e-trikes or even e-quads. Audi designers are picking up on this trend and transferring it into the brand’s progressive design language. The Audi urban concept Spyder technology study is a showcase for the mobility of tomorrow. The electrically driven show car brings together elements of a race car, a roadster, a fun car and a city car. An important aspect of the Audi Urban Future Initiative is the award established in 2010. With a prize of 100,000 Euros, it is Germany’s most highly endowed architecture competition. This year, the award is being offered for the second time and is centered on the question of how mobility can become an engine for urban development. The five participating architecture and urban planning firms are called CRIT (Mumbai), Höweler & Yoon Architecture (Boston/Washington), NODE Architecture & Urbanism (Pearl River Delta), Superpool (Istanbul) and Urban-Think Tank (São Paulo). Many of the projects being run by Audi address the ongoing development of the world’s rapidly growing cities. In the Audi Urban Future Initiative, one of the company’s think tanks, we are seeking intelligent approaches for the mobility of tomorrow. 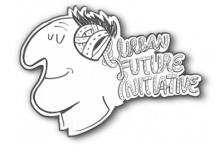 The Audi Urban Future Initiative was established in 2010. It is a global forum that brings together experts from diverse cultures and disciplines. Architects, sociologists, urban planners and trend researchers discuss new approaches and solutions for mobility in the world’s megacities. The focus is on a wide range of topics – such as seamless mobility through the interconnection of various means of transportation, the flexible use of space or the vision of the city as a continuous flow of movement without stationary traffic. An important element of the initiative is the Audi Urban Future Award, which Audi offered for the first time in 2010. 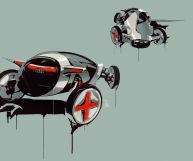 Audi is interested in the design ideas of students – such as those from this project with the Royal College of Art in London. Audi has an enlightened approach to design and is constantly seeking fresh ideas. One key aspect is the cooperations with renowned schools of design – such as the Pforzheim University School of Design, the Royal College of Art in London, the Art Center College of Design in Pasadena, California and two schools of design in Milan. How will mobility in the world’s megacities evolve; what form will it take in future? The Audi Urban Future Initiative is seeking answers to these questions.